I’m not sure when or where it very first began, but sometime in the past few years I noticed a wondrous thing of beauty starting to appear on the appetizer table at social gatherings. It was warm and creamy and spicy, and it elicited publicly inappropriate yum-noises from yours truly. I’ve heard it go by many names, but I’m sure you’ll recognize it when I say: buffalo chicken dip. But I couldn’t give up on my beloved buffalo dip entirely. I determined to create a lighter, more figure-friendly version so I could indulge without the guilt. I turned to tofu for its creamy texture and relatively neutral flavor, thinking I could simultaneously veganize the dish as well. Several batches later, I gave up. It just wasn’t right, wasn’t hitting all the spots. There wasn’t a single yum-noise to be heard. Fast forward a couple years to December 2011. As we were preparing for the family holiday party on Chris’ side, I decided that I wanted to have buffalo dip. Since I was firmly on the veggie train and tofu hadn’t worked previously, I figured I could just use vegan cream cheese and Vegenaise to get there instead. Screw figure-friendly. Except, my sister-in-law is mega allergic to soy. Whenever I make something to bring to a family gathering, I try to make sure as many people can eat it as possible; food is always best when shared. I just couldn’t bring a soy-laden dish to the party in good conscience. And then I had an epiphany. Why not use beans as the base—they get nice and creamy when blended—and add some raw cashews for extra richness? And I’ll be damned if it didn’t come out every bit as delicious as the original. It has that classic buffalo flavor that you can only get from Frank’s Red Hot sauce. Fresh parsley and chives hint at the ranch dressing that would typically be stirred in. Whole chickpeas go in for texture, replacing the usual chunks of chicken. Cheddar-style Daiya shreds contribute a buttery cheesiness and a hint of guilt to what otherwise turned out to be the lightened up dip I was originally trying for. Also, I’m just going to put this out there: this Buffalo Chickpea Dip sat right next to a non-veg version at the holiday party. Not only was this one gone at the end of the night, but its neighbor had hardly been touched. Indeed, many a yum-noise was made. The cashews do not need to be soaked for this dip, but if you’re the soaking type or don’t feel terribly confident in your blender/food processor’s capabilities, feel free to soak them overnight. Also, I have found that this dip tastes its very best when made at least a few hours ahead to allow all the flavors time to meld together; cover with plastic wrap, refrigerate, and bake off just before serving. 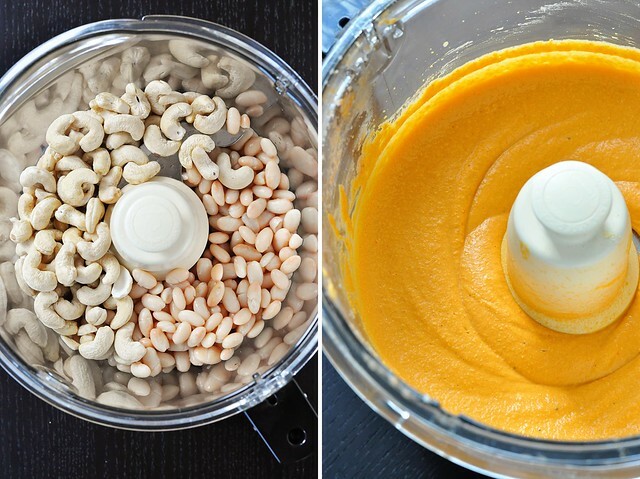 Add the beans and cashews to the bowl of a food processor. Pulse several times to break them up a bit. Add the hot sauce, non-dairy milk, lemon juice, nutritional yeast, onion powder, garlic powder, and a pinch of black pepper. Process until the mixture is entirely smooth (this will take several minutes), stopping to scrape down the bowl as necessary. Adjust salt to taste. Scrape the bean mixture into a bowl and stir in the parsley and chives to evenly distribute. Stir in the chickpeas and 3/4 cup of the Daiya. Transfer the dip to a 9×9-inch square baking dish and sprinkle the remaining 1/4 cup of Daiya on top. (Note: Dip can be made up to this point a day or two ahead. Cover with plastic wrap and refrigerate until ready to heat and serve.) Cover baking dish tightly with foil and bake for 30 to 35 minutes, until warmed through. Serve with tortilla chips or veggies for dipping. This looks INSANE! I can’t wait to make it!! And yes, I bet it’s just as yummy, if not more, than the original version. And I love how you use white beans and cashews. Yum! Hot damn does that sound delicious. As a carnivore, this is vegan I can get behind! This looks amazing! I’ve actually never had the chicken version of this….. But still, I think I’ll try this! Holy yummness. This looks amazing! I want it. Right. Now. I have a friend that makes the chicken version, but since I can’t eat dairy, I’ve never had it, and I’ve always been jealous. I am so making this for the next party I go to. What size cans of beans and chickpeas? thx! Gerry – Just your standard 15-oz cans. I’ve updated the recipe to note that–thanks for the reminder. I will have to make it without the beans (no beans of any kind for me). I just made this dip. It is excellent! Yum, Yum! Yay! So glad to hear it, Stef! Omg!!! Thanks for posting this recipe! I made it and it is absolutely delicious!!!!!!! Woohoo! Thanks for the feedback, Renee. It’s one of our favorites, for sure. This is a FABULOUS recipe. Thank yo so much for sharing it. I would be perfectly happy to eat nothing but hors d’oeuvres/finger foods/dips, so I am always on the lookout for new vegan recipes. This dip has wonderful flavor, texture and visual appeal. I’m looking forward to serving it to my non-vegan friends to see their reactions. I just finished prepping the dip and have to admit i was a little worried when i started b/c all i could smell was the nuts and white beans, but i must say, it smells and tastes really good. I can’t wait for my vegetarian friends get to taste it! I’m curious how this would turn out without the cashews….as this sounds amazing but alas I’m mega allergic to tree nuts… any suggestions for what could be used instead…or if ommitting them all together would make a huge difference? Jessica, omitting the cashews from the recipe altogether would probably throw off the flavor balance, so you will want to replace that volume with something. While I can’t promise that it will be exactly the same, you could try replacing the cashews with additional white beans (1 cup). It will probably have a more bean-dip like texture. If you wanted, you could also try adding in a couple tablespoons of tahini or sunbutter for creaminess. Please let me know if you do any experimenting and how it turns out! I will also try without cashews. I wonder if I could substitute with sunflower seeds somehow. I will let you know how it comes out! My son is allergic to cashews so I replaced with 1 C sunflower seeds. It might not be quite as creamy as the cashews, but the taste is fantastic. Hope that helps! This is the best buffalo dip I’ve ever had! 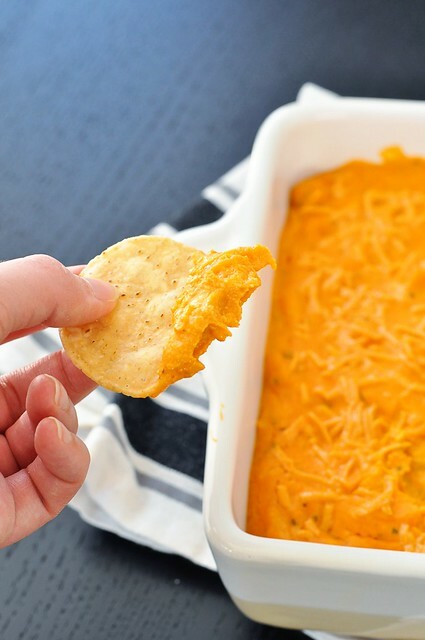 This will be the perfect dip to bring to football parties all fall long. This is incredible! I mixed in a little vegan bleu cheese since I had some handy, but I don’t think it needs it at all. Unfortunately, this dip inspires gluttony. You had me at “Buffalo Chickpea.” Back in my pre plant-based diet eating days, I enjoyed the original version a few times and absolutely went crazy over it. I also knew that it was so not going to be doing me any favors. I’m so excited to try your vegan version at my Plant-strong Superbowl Party. I just can’t wait! Guessing the vitamix is overkill on this version also? Think I could use my immersion blender? Thanks! Peggy – I haven’t tried my Vitamix on this yet because I’ve felt concerned that the mixture may be a touch too thick. I’m probably overthinking it, though, and should try it at some point because I do think it would potentially come out well. Please let me know if you do try it in the Vitamix, and I’ll definitely update if/when I finally decide to give a go. Mmmm! As soon as I saw this recipe I knew I had to try it. It is so delicious! I will definitely be serving it at my next gathering, and passing the recipe along to friends. Thank you for a real winner!!! True, food is better when shared. Looks delish; looking forward to trying! This is perhaps the best veganized recipe of all time! It came out absolutely amazing! Thanks so much for sharing. Oh my goodness! You have NO idea how excited I am about this. You sound like me with my favorite buffalo chicken dip that I still endure suffering for once in awhile. I will definitely let you knwo when I try this!!! Just made this for the Super Bowl Party we are going to tomorrow. Thanks Wendy for the link. My husband was a bit leery, so I cooked a small portion of it up for him. He thought it was so good. My seven year old couldn’t get enough and I loved it. Look forward to sharing it tomorrow. Thanks!!! I used to make buffalo chicken dip all the time back when I ate meat, so I was excited to try this recipe. It was delicious!!! I added the chickpeas and cheese while still in the blender and pulsed a bit because I like a smoother texture. Mmm perfect! Hi, I have just stumbled upon your recipe. I have been looking for a buffalo one and this sounds delish. Can’t wait to make it this weekend!! I made this for a party and it was a huge it! So delicious! I made it without chives and it was still fantastic. This is by far the best vegan bean dip on EARTH! Quick Vitamix question, Britt. What do you mean when you say you’re concerned that the mixture may be too thick? I thought the Vitamix could blend an avocado seed. In that case, surely it could handle this, yes? Yes, a Vitamix could turn a shoe into a smoothie if you we’re so inclined, but you would need a bit of liquid to get it moving. I’ve had issues before when making things like raw cheesecake from cashews where I had to keep adding more liquid because the mixture was so dense that it jammed up my machine and made it scream. Of course, it moves smoothly once everything is “wet” enough, but that lock up period is annoying. I feel 99% confident that this would work as written in a Vitamix, but can’t say for certain that it won’t freeze things up and need a bit more liquid. For some reason I still haven’t tried it in mine…. Do let me know if you give it a whirl! I’m trying to stay away from the processed cheeses. Do you think it would be okay without the Daiya? I make other vegan cheeses without it so I thought it would be okay flavor wise but wasn’t sure about consistency. Should I substitute it with a different ingredient? Tiffany – The dip will be okay without the Daiya. It’s mostly there for flavor. I’ll admit I’ve sampled the mixture straight out of the food processor (pre-Daiya) many many times and it’s delicious at that stage! So yeah, you should be totally fine just omitting it. We love this recipe and it is our go to recipe to share with others. It is totally addicting. This dip is as good as advertised. I never knew a vegan dip could taste good. Will be making again! So, has anyone made this without Cashews? Just curious because I know my 3 to would love this and he’s extremely allergic to tree nuts. Hi Sarah! My brother actually made the dip without the cashews because he just plain ol’ couldn’t find any raw ones. He replaced them with an extra cup of white beans and said it came out great–and that’s after he’d tasted the original recipe made by yours truly! I just made this for a party and people were raving about it. I am the token vegan in my friends group so this was a big deal for me that I could serve something vegan that was considered amazing by all my non-vegan friends! It was SO EASY too!! It will be my go to dip from now on, thank you so much!!! I just tried this out to see if it would work as an appetizer for later this month. Even though I skipped the chives, parsley and the cheese, it was yum. I will be making this again. I haven’t had the dip in any other version. I made this for a party and it was awesome!!!! This was a HIT! I mean, they couldn’t stop eating it. And my kids, too! Decided to make this spur of the moment to take to an omni party tonight. Of course no original Frank’s left on the shelf at the store so I substituted Frank’s Hot Buffalo Sauce instead. So tasty out of the mixer!! Mashed the chickpeas a little for texture and disguise – can’t wait to see how it’s received. Thanks for a tasty and healthy recipe! So amazingly good! Thanks for feeding my Frank’s Red Hot addiction in a healthy vegan way! I left out the Daiya and it is so tasty!! I made this a few weeks ago for a cocktail party. It was a huge hit with all omnivores! They devoured it, asked for the recipe and have actually made it. This is seriously one of the best party dips out there. you can make it in advance and it will be devoured within minutes. We made this tonight and it was wonderful! I left out the Dayia and added extra chickpeas and it was perfect! The flavor was great. I made two batches of this dip it was so great! I decreased the amount of hot sauce to 1/2 Cup just because I’m sensitive to spice. Delicious! Made this – loved it! I used the whole daiya pkg as I made it at a non- vegan’s house and it’d go to asteroid. I also increased the amount of hot sauce and cashews (had bought a bit more than a cup of cashew and had needed more kick for my taste). Brought to a baby gender reveal ( who thinks of these things?) and it was mostly devoured. Making again today for my get together. Noms! Thanks so much! Britt, are you SURE you’re not from Buffalo?? You nailed it with this recipe. This is hands down the best Buffalo dip we’ve tried. The non-veg members of my family say it even tastes better than the original. We did a side-by-side and this recipe was preferred over the original by everyone, including some Upstate New York omnivores! I made it exactly as your recipe indicates except that I added the chickpeas and Daiya to the mix in the food processor and pulsed it a couple of times. The result was fabulous (and could still turn into an embarrassing “one dish equals one serving” situation just because it tastes so good!). I love that it’s vegan, soy-free and gluten-free and is packed with healthy beans. THANK YOU!!!!!! My veg life is now complete. Fantastic! I made this for my husband (lactose intolerant) and me (vegetarian) as an appetizer for watching a World Cup game and we ended up splitting it for dinner (oops!) Now, hubby wants it repeated! Any recommendations on heating/serving in a crockpot to keep it hot during a party? Thank you for this recipe! It was well loved at a party. A gluten free friend thought it was his birthday. My partner even took the bowl once it was gone and scraped down the sides. My only change was that I replaced the chickpeas with a can of jackfruit that I squeezed dry and shredded. It almost gave it a shredded chicken texture. This dip was FANTASTIC! It might even be my favorite vegan dip! I didn’t even make this for a party, or to share with friends: my husband and I made it to eat for dinner for vegetables I figured with it was healthy enough to eat as a meal with veggies. Aww thanks, Heather! My husband and I definitely have this for dinner on occasion as well. So glad you guys enjoyed it! I have found that subbing soaked RAW sunflower seeds works well if you have to skip the cashews. Awesome Rebecca–thank you for sharing this! Such a great tip, especially for the nut-free folk out there. If you used siracha instead, how much would you put in? 3/4 of a cup seems like it would blow your head off! Hi Kim! Using sriracha would completely change the flavor of the final dish, but if you wanted to give it a try I would suggest starting with 1/4 cup (which I think will be pretty mild) and then gradually add more until you like the flavor/heat. Damn – I just used half a cup of srirachi, not realising it was different. It’s soooo hot raw, but I haven’t left it to sit yet. Perhaps it will get worse? So I don’t process the chick peas?? Carrie–that is correct. The chickpeas are stirred in whole for texture, similar to how non-vegan versions of this dip will often contain pieces of chicken. The chickpeas are actually my future brother-in-law’s favorite part! Would using roasted cashews be okay? I could not find any raw ones! Thanks! Misty – Sorry for the seriously delayed response! Hopefully this will still be helpful…. Roasted cashews are going to have a very different flavor and consistency in the finished dip. Others have used an extra cup of white beans in place of the cashews with good results. If you can find raw sunflower seeds, I’ve been told that soaked raw sunflower seeds work nicely as well. Also, if you want, you can order raw cashews online through Amazon, which is actually what I do since I go through them like crazy! This recipe is delicious. Daiya needs to credit you for it. Awww, Ericka–thanks! So glad you like the recipe. great recipe! Any idea how far ahead it is okay to make this? I’d like to make it for tomorrow evening but prepare it now. Thanks! Chelsie–I always try to make it a day in advance. It tastes better that way. Today for tomorrow evening is perfect! You could probably make it two or even three days in advance if you needed to. It should keep for about a week from the day you make it. Delicious! This was a hit at a BBQ party this weekend. Several compliments. We aren’t vegan (and I didn’t have some of the specialty ingredients) so I used cow’s milk and a little regular shredded cheddar. Everything else I kept the same. I didn’t soak the cashews, but next time I will plan ahead better. I think soaking would make the dish creamier/moister. Most guests said that nut thins were their favorite for dipping (vs wheat thins or corn chips). Thanks for sharing this recipe! Y U M M Y!!! I tasted it after adding mixing everything together and kept adding more and more sauce (Frank’s) until I had essentially doubled it. I could literally (and have) drink that straight from the bottle. I also mashed up the chick peas a bit to give more of the shredded feel and didn’t have the fresh herbs on hand (or cheeze). I’ve tried a vegan buffalo dip with jackfruit – it was ok – this was amazing! Hi Coulinjo – I have not personally tried to make this dip with anything other than Frank’s Red Hot sauce. It’s relatively mild (I find) in terms of hot sauce and is the only way to get that true *buffalo* flavor. (In a pinch, my recommendation would be to use Tabasco.) When using the Frank’s, I have never found the dip to be bitter or too spicy before baking–in fact, I have to keep myself from eating it straight from the food processor! I can only imagine the off flavor is from the hot sauce you used. Also, the “cooking” part of the recipe is really just to warm the dip and melt the cheese, and, if anything, it seems to taste a bit hotter to people when warm–which is unfortunate if it’s already tasting unbearably hot. If you have time to remake it, I would strongly suggest looking for the Frank’s and making it as written. And if you can’t find that, either Original or Chili Garlic Tabasco sauce should give you a flavor and level of heat closer to what’s intended. Hope it works out! I made this last and brought to to work for a party today. It is sooo gooood! and even the non vegans like it!!!! Just wondering what I could sub with the hot sauce here in the UK. Sue, unfortunately I’m not familiar with hot sauce brands in the UK! 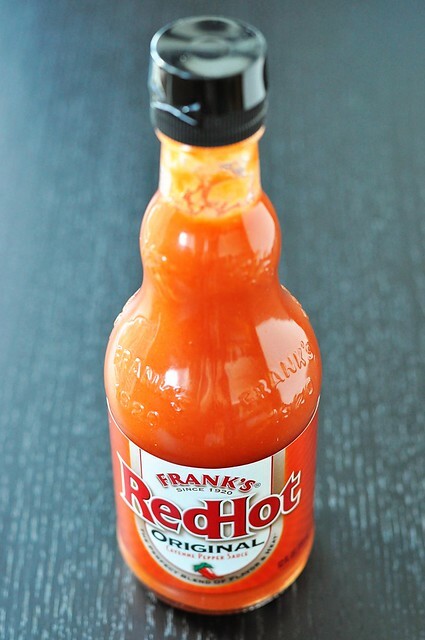 Frank’s Red Hot’s ingredients are: Aged Cayenne Red Peppers, Distilled Vinegar, Water, Salt and Garlic Powder. Hot sauces are pretty variable in taste, but if you can find something with a similar ingredients list, hopefully it will work! I accidentally processed the chickpeas too. Lol. Still delicious! This recipe definitely looks amazing! Do you think it would be good with something like Beyond Meat Chicken strips? Elizabeth, yes! I think you could totally dice up some Beyond Meat in place of the chickpeas. About a cup and a half should do it–or you could do more or less to your liking. I’ve made this three times now and I absolutely love it. I leave out the yeast and the Daiya, because I’m not going for a Cheese-y taste. I actually found this while looking for a cheeseless dip, not specifically vegan. But I’m totally down with it. I also like to blend in half the chickpeas and stir in the other half, because I think it comes out with a better texture and better ratio of dip to whole chickpea pieces. Hi! I can’t wait to try that!! It’s in the oven right now, taking it to a football party later today. Mixture tastes great right out of the food processor. My food processor was unable to get the mixture completely smooth, its old lol. However, I do think it will turn out just as good and maybe the texture won’t be too off. I just want you to know that I make this dip for every single family gathering I go to now! 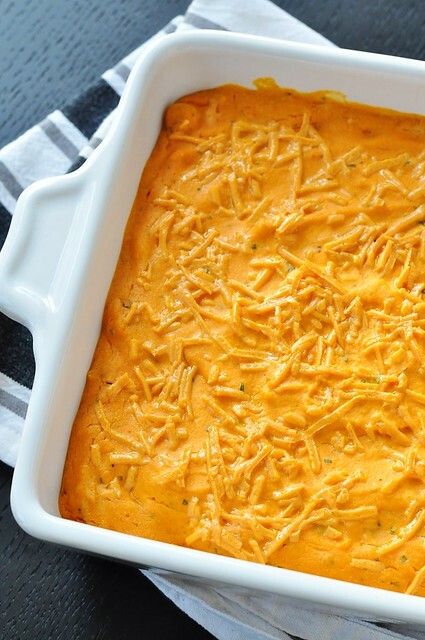 My boyfriend’s favorite food is buffalo chicken dip so finding this recipe was just what I needed to be able to eat what he likes too!! We are obsessed!! Everyone, no matter their dietary preferences, LOVES this.